The market lost $25 billion today, reflecting more than a 2 per cent drop in New York on Friday. 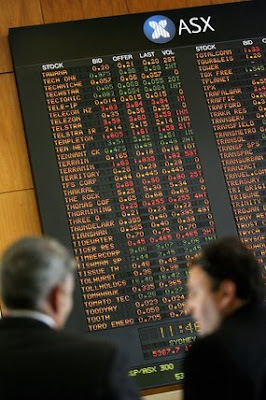 The All Ordinaries Index dropped 106 points to 5,949 and the ASX 200 slipped 100 points to 5,920. On the Sydney Futures Exchange, the September share price index contract lost 89 points to 5887 on a volume of 17,254 contracts. CommSec chief equities economist Craig James says the market is likely to be volatile for some time. US equity markets ended in turmoil on Friday, after a senior executive of mortgage underwriter Bear Stearns said that the "fixed income market turmoil was the worst in 22 years''. US data also was on the weak side, with jobs figures fanning worries about the strength of the economy. "Investors are still unsure how many skeletons there are in the closet in the US sub-prime mortgage market," he said. "Until they get certainty about the state of that market then we are going to see further jitters. "We certainly saw that in terms of the Australian share market today, down in the order of 1.75 per cent." It was a bad day for the banks. Australia's biggest investment bank, Macquarie Bank, continued to be dragged down by concerns over the mortgage market in the United States. It lost 6.6 per cent to $70.05. Global investment company Babcock and Brown dropped about 4 per cent to $24.02. The other major banks also dropped in value amid speculation the Reserve Bank will raise interest rates on Wednesday. TheNational Australia Bankk shed 63 cents to $37.37 and the Commonwealth Bank slipped 51 cents to $52.80. In the resources sector, lower oil and base metals prices pulled down the big miners. BHP Billiton shed 79 cents to $35.90 and Rio Tinto slipped $1.86 to $86.96. Bluescope Steel announced its chief financial officer Paul O'Malley will succeed Kirby Adams as the company's managing director and chief executive. The company's shares still dropped 10 cents to $10.35. The Australian dollar was buying 85.53 US cents just after 5:00pm AEST. In other currencies, it bought 61.81 euro cents, 41.80 UK pence and 100 Japanese yen. Gold was worth $US673 an ounce and a barrel of West Texas crude oil fetched $US75.41. "There is still a focus with sub-prime issues and the uncertainty there is really knocking around the investment banks,'' he said. "Macquarie, Babcock and Alcoa are all suffering.